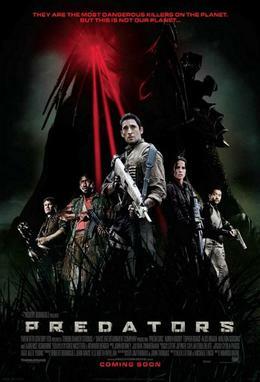 One doesn't necessary have to wonder what was in producer Robert Rodriguez or director Nimrod Antal's minds when they made Predators, thanks to their commentary track on the DVD. I didn't listen to all of it since that would mean having to endure watching this pile of junk again, but I did hear endless self-congratulation that these two fans of the Predator series created such a fun film that would thrill the fans. Granted, I never saw Predator II but did suffer through Aliens Vs. Predator and Aliens Vs. Predator: Requiem, yet Predators doesn't come close to overtaking the original in terms of story, action, or entertainment. We plunge right into the story, with Adrien Brody falling from the sky and barely opening his parachute before crashing into a jungle. Soon after he's joined by Nikolai the Russian (Oleg Taktarov), Danny Trejo as The Mexican, Alice Braga as The Woman, Mahershalalhashbaz Ali as The African Muslim, Walton Goggins as The American Convict, Louis Ozawa Changchien as The Yakuza, and Topher Grace as The Twerp Doctor. It's like a United Nations of Thugs. Each has also crashed onto this jungle, fully armed, save for the Twerp Doctor, ready to fight. Having elected himself Leader, Brody has the group marching around the area and being all of them, they follow him. Soon, after having escaped a monster trap, they discover they are not on Earth. Brody then realizes they are on a game preserve on this Planet X, and they are the hunted. One by one, they are being eliminated by Predators, the Mexican and the African Muslim being the first to go per tradition, which makes one wonder why the Mexican-American Rodriguez went along with this; they discover Morpheus, I mean Noland (Laurence Fishburne), who has survived on the planet for several years. Now we have some bonding time when we can get to know some of the characters: the Russian has two children, the Yakuza finally speaks, but Noland, apparently channeling Kurtz from Apocalypse Now, tries to kill them. Now it's the Russian's turn to die after having saved the Twerp Doctor. In order to stop the Big Predator from killing them all (apparently there are two varieties of Predators who hunt each other), the American Convict sacrifices himself. If you're keeping count, we have three people: Adrien Brody, The Woman, and the Twerp Doctor. Any guess as to which one is The Villain? Any guess as to who survives? Any interest? Rodriguez and Antal are perhaps the finest example of what happens when you give fans of a film series/franchise the opportunity and budget to make the film of said series/franchise the way they want to. In certain respects, they live up to their geek dreams: Predators is bloody. It is also cliched, trite, non-character driven and almost without plot, logic, or point. The script from Alex Litvak and Michael Finch, with ideas from Rodriguez and Antal I'm sure, reminds me of a line from Sunset Boulevard: it does sound like the actors are making it up as they go along. It also looks like they made the actual story and screenplay up as they went along too. Predators cannot truly be called a reboot or remake because The Woman makes reference to the events of Predator. In this regard, you can attempt to call it a sequel because it is suppose to take place after that film. 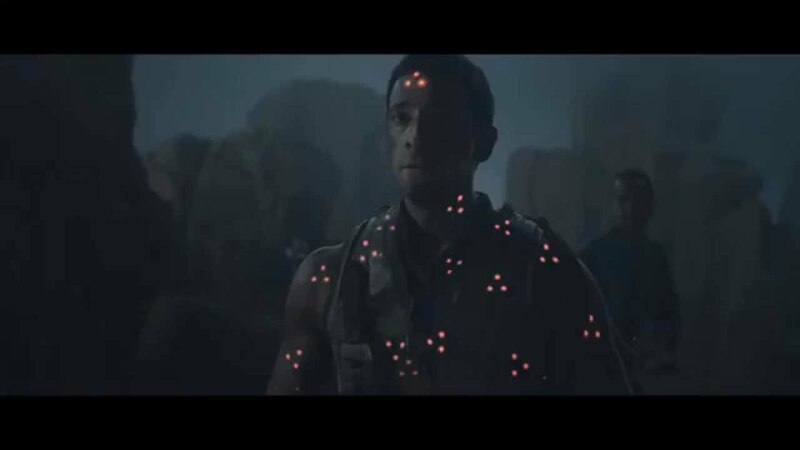 However, where Rodriguez and Antal went wrong is in failing to understand that while Predator may not be a brilliant film, it knew enough to let us know the characters and care about their plight. 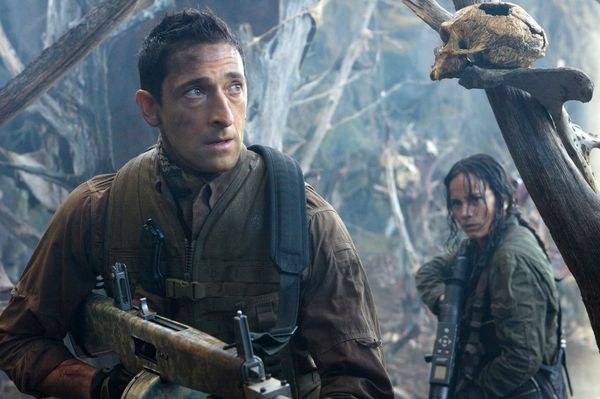 Predators, by contrast, just gives us rather repulsive characters whom we don't have any vested interest in seeing survive; in fact, I was rooting for Topher Grace's character to die. They show that they aren't interested in the characters because they never bothered to give us names for almost all of them. You may have noticed I never really referred to the character by their names but by their characteristics: The Mexican, The Yakuza, The Woman, etc. This is because throughout Predators, we never learned their names, or at least that I remembered them having any. That appears to have been a selling point: it's only at the end when Brody tells The Woman his name (Royce) and The Woman tells Royce hers (Isabelle). It's a sign of how Predators doesn't have any interest in the characters as individuals because they don't have to have any names. 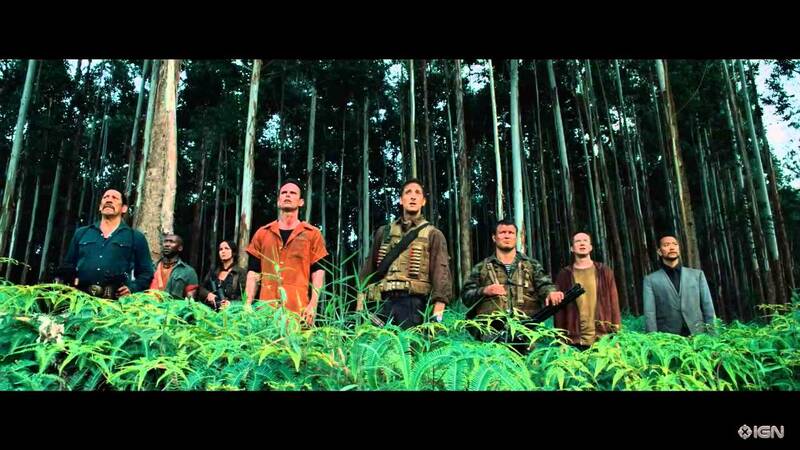 It would stand to reason that if one finds himself in a jungle with a group of strangers with guns one of the first things you'd do is tell each other who they are, but Predators isn't interested in characters: it's interested in killing Predators. Side note: Trejo's character does have a name. It's Cuchillo, which is Spanish for 'Knife'. Therefore, he's gone from being Machete to Knife. Not much of a stretch, was it? There isn't any real acting in Predators because like names, those things aren't important. One wonders how Rodriguez and Antal decided that the perfect substitute for Arnold Schwarzenegger would be Adrien Brody: a star whose whole career has been built on his massive physique replaced by someone best known as a rather gentle, physically non-threatening serious actor. Brody appears determined to keep the body he built for King Kong, and granted seeing a buff Brody is a change; whether audiences will accept it is up to them, though I respect his willingness to go all in for a physical transformation. Still, in terms of acting, Brody appears to think that by just growling his lines he signals intensity. None of the other people here do anything since they aren't required to be anything other than stock characters. Grace is the only one to do anything, but his character makes everyone else, especially Brody's, look incredibly stupid. If all these people are trained killers, why does Brody never stop to ask what Topher Grace is doing there? You know instantly that Grace's Twerp Doctor is going to provide a "shocking twist" but it doesn't come off as either shocking or a twist. In fact, it's a long wait to get to his Big Reveal, which renders his character even more annoying than normal. Grace, like his That 70's Show cohort Ashton Kutcher, appears to have built a career in films out of playing the same character. It's really Eric in Space, only it's a "Dark, Evil" Eric. While watching Predators, you keep thinking that Topher's survival better have a big payoff, otherwise it won't be worth it. It didn't have one; it had a predictable one, one that was visible from miles off. I did think Fishborne was going to call himself Morpheus, and while he gave it his all to come off as crazy it just came off as exaggerated. 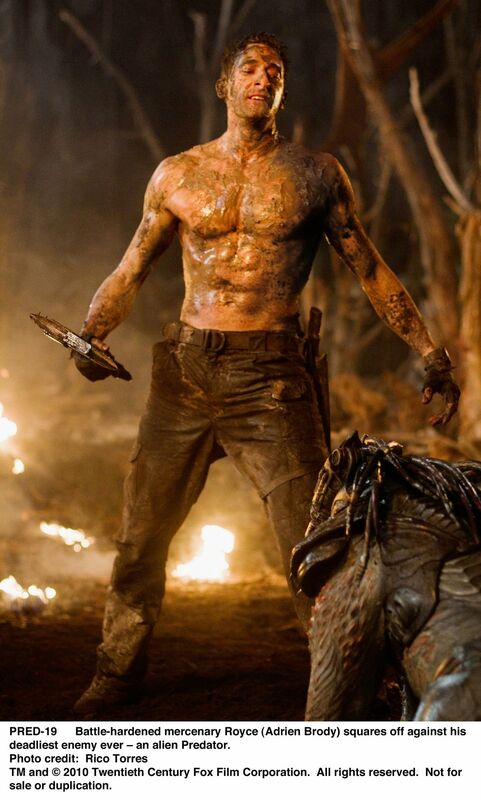 Going back to Predators almost gleeful desire not to have an actual plot, at one point Brody says, "It doesn't matter what happened, or why". I figure that's because it would never be explained. Why were these individuals picked, apart for their killing skills? Who picked them? Why not hunt them on their own turf? I guess Rodriguez, Natal, and their fan base don't care; we're merely suppose to be excited that the Predators are coming. We weren't. Instead we were endlessly bored and frustrated that there was no story or characters in Predators, just a shameless effort to cash in on a franchise and leave the door open for a sequel. Predators leads me to believe certain things. It makes me think fans of the series don't care about the characters within the film. It makes me think story doesn't matter either. What does matter: beheadings, lots of them. Gore extraordinaire. Lots of shootings with big weapons. I trust Rodriguez and Antal had a good time making this film, and that those who don't use thinking skills to watch their films had a good time too. For some of us, who still think such antique ideas like plot and characters are important, Predators is a sad and sorry exercise in bulk over brain. Good try, Brody, but sorry Adrian; you're no Arnold.